From time to time, you’ll encounter a bolt that simply won’t budge. Stripped threads are another common issue you may experience. However, there are numerous tricks, or hacks, that you can use to loosen stuck bolts of all types. Many of these solutions can be done with simple tools lying around the house. You’ll be able to resume work, whatever it may be, within minutes. Professional mechanics usually have their favorite method. Here are seven of the most common ways to remove a stripped bolt (or rounded, rusted, or seized). Sheer impact and force is one of the most effective ways for removing a seized bolt. 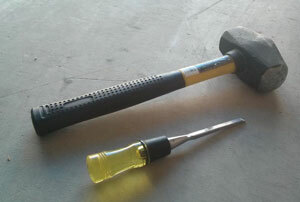 A simple chisel, or large flathead screwdriver, and hammer will solve the problem most of the time. Nuts or bolts that are extremely stuck may have to be removed with an impact gun. Using a lubricant like WD-40 can make it drastically easier to remove the stuck nut or bolt. If you recall the properties of metal, temperature has a great effect on metal, causing it to contract and expand. Obtain a blow torch (some heat guns also work) and heat the frozen bolt until it gets red hot. This extreme heat will cause the metal to expand. Once it cools down, it will begin to contract to its original shape or size. This process of expansion and contraction will break the rust bonds between the bolt and the threads, allowing easy removal. 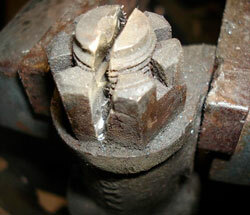 One sure-fire method for removing just about all stuck bolts or nuts are relief cuts. Simply make two to three cuts through the bolt head or nut. Hitting it with a chisel and hammer should then relieve the tension. Relief cuts work a whole lot better on nuts, due to them being the exterior part. You will, however, need a metal-cutting tool for this hack such as a good oscillating tool. This process simply involves taking a ratchet, placing it on the bolt head or nut, then rocking it back and forth rapidly. Applying a lubricant will make matters a whole lot easier. Keep in mind that simple leverage can get the job done too. A metal pipe can allow you to get extreme amounts of leverage and force. You can also try rocking the bolt or nut vertically as well. Although this method is virtually guaranteed to get your problem fixed immediately, it may cause damage to the threads, more often than not. However, you can use a more in-depth process to ensure no damage to the threads by gradually increasing the drill bit diameter until you’re able to chisel the left-over metal out. More than likely, you’ll need a special metal-cutting drill bit, depending on the material of the stripped nut or rusted bolt. You can use this method to remove a rounded bolt as well. 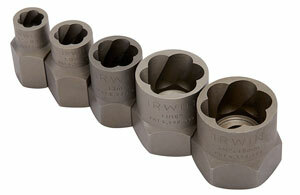 If you need to repair any thread damage, a tap and die set will help you out. There are a few different types of bolt and screw extractor sets that allow you to remove a stripped bolt using pretty innovative methods. Some of the kits use hardened bits that grab the inside of the bolt securely, allowing sufficient force to be applied. Some of the kits are very reasonably well priced too. Removing rusted bolt can sometimes not being practical for the situation, especially if the job has a deadline. Drilling a new hole and installing a new bolt or nut may be a whole lot more simpler. Resorting to this method is usually a last-ditch effort to remove a stuck nut or bolt, especially if there aren’t the necessary tools lying around. Under some circumstances, alternative securing devices like zip ties, may also be used.